The Place Located conveniently opposite the National Library, Rabbit Owl Depot is one of the latest ice-cream parlour to open in town area. It is a fairly small café, which has a rugged industrial theme from the design of its piped-like chairs. There is a serious lack of specialised ice-cream cafes in the Bugis and Cityhall area for some reason, which is definitely a strong advantage for Rabbit Owl Depot. The Food There are more than a dozen ice-cream flavours here, and you can expect the usuals though we heard that the best flavours are the Roasted Black Sesame and Pistachio. 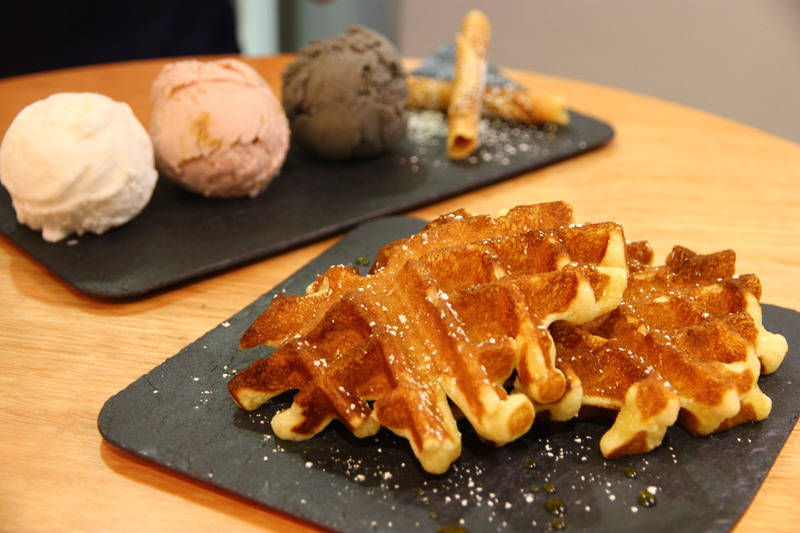 There is the option of topping the ice-cream on waffles, or simply go for the more value for money ice-cream platter which gives you the choice of three flavours. We had the Waffle ($6.50) and the Ice-cream Platter ($9). I was slightly disappointed that the Pistachio was sold out for the day, so we settled for the Roasted Black Sesame, Strawberry Cheesecake and Coconut. The Roasted Black Sesame was my favourite, with its thick and strong sesame taste. The waffle had a very light texture which was not too sweet, and it did go well with our ice-cream. Do request for less maple syrup and sugar icing if you want it less sweet like we did. Will I return again? I need to try the Pistachio flavour on my next visit. Otherwise, Rabbit Owl Depot is a good option for some sweet treats if you are in the Bugis vicinity.